As a sculptor, Bartholdi depended for his livelihood largely on public commissions for sculptured works. Chiefly commemorative monuments throughout France, with a few in this country, they may be identified with countless others by his contemporaries in their commonly shared, academically inspired artistic vocabulary. For Bartholdi, Liberty was not a commission but a passion, all-consuming of his energy, time and especially of his personal finances. Bartholdi spent his time confined to work at home, apart from trips to the United States; the first in 1871 when Bartholdi recognized at once the small island in New York harbor as his preferred site for Liberty, the second for the Centennial in 1876, and a third ten years later for the statue’s inaugural. Work included not only pursuit and execution of public commissions but embraced as well the year-in, year-out struggle to see to completion what he regarded as the single most important project of his life. Parallel to the construction of the statue of Liberty but unrelated as either preparatory studies or as models utilized in the process were reproduced casts made in France principally for public sale. Apart from the Modèle du Comité, reproduced by Bartholdi himself, casts in metal representing the serial reproduction of the statue by a commercial foundry were made beginning probably in 1878. As one of two foundries in Paris in which documented casts of Liberty were produced, Avoiron et Cie. was the only foundry to reproduce the statue in cast for direct sale, and the only one with which Bartholdi had a contract. In Didot-Bottin, Avoiron et Cie. was regularly listed throughout the 1880s with an address in Paris at 56, Boulevard Voltaire. The firm was founded in 1844 by a Monsieur Chanagne and taken over by Avoiron, Chanagne’s son-in-law, in June of 1876. Employing fifty to seventy-five workmen, the foundry produced an array of commercially saleable items ranging from statuettes to candlesticks. By 1881 Avoiron had acquired a partner named Clement, and in the same year participated in the Exposition Internationale d’ Electricité de Paris. In the exhibition’s catalogue Avoiron et Clément is listed as specializing in “fittings for electrical lighting, lamps in all styles, and models for all systems of electrical lighting”. 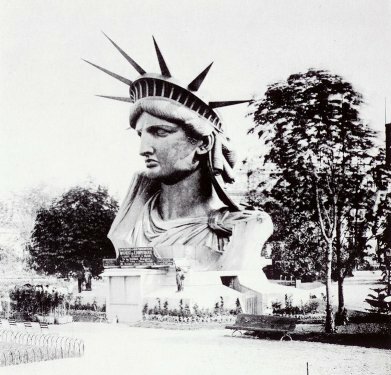 Avoiron’s production of Liberty in serial casts can be traced with certainty to 1878 when one of two models displayed on either side of the full-scale head of Liberty on view at the Exposition Universelle is in photograph unmistakably an Avoiron cast. Casts of the statue were made by the firm in four sizes with the largest, probably the first to be produced in series, based on Bartholdi’s four-foot Modèle d’ étude. In what quantity casts in each size were made, and for how long they continued in production are unknown. Inscriptions, both those in the mold-and therefore in each model cast from the mold-as well as those cold-stamped after casting offer evidence that production was considerable, with the likelihood that as many as three hundred or perhaps more in the largest size alone were eventually reproduced. Beginning at least by 1878, Avoiron had a contract with Bartholdi which ended in the fall of 1886; whether production continued until the contract’s end or was concentrated in the earlier years is impossible to determine. Casts of Liberty in full figure by Avoiron are distinguished from casts by other founders, including those made in America as well as in France, by their distinctive self base which is circular rather than square. Moreover, they were the only casts produced with a United States copyright number and date included as part of the inscription on each model. 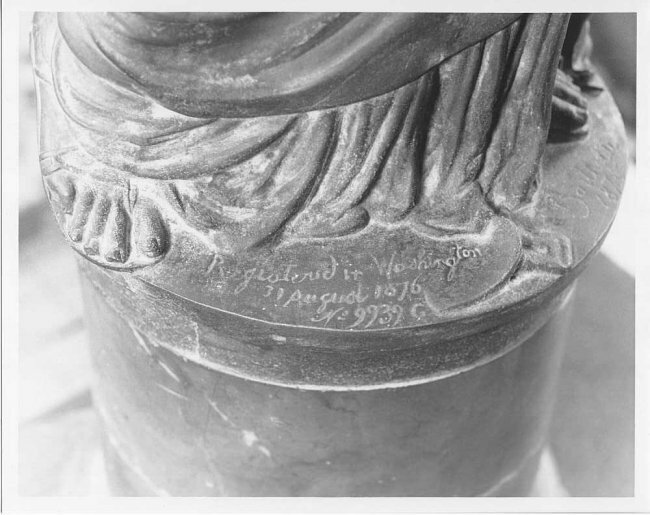 Bartholdi’s copyright, 9939 G dated August 31, 1876, is registered in official records of the United States Copyright Office under the title Statue of American Independence. On the registry page beneath the title is written “Photograph on file”, and in the upper left corner, “c.Aug 11 77, c.24 June 85”. Considerable mystery surrounds the later entries, generated by the sale in about 1915 to the then Liberty National Bank, in New York, of an Avoiron cast that reportedly had been purchased some years earlier from the U.S. Treasury department. Over the years, the bank became convinced theirs was one of two models placed on deposit by Bartholdi in the Copyright Office, a conviction supported by the problematical entries, and a small volume published in 1943 by the bank (by then it was the New York Trust Company) declared, “This model and a counterpart whose present whereabouts is unknown…were the first bronze castings made by the sculptor”. It was further suggested that both models were those deposited with the application for the copyright even though after the fact. With this, the issue became public and ever since, one or another Avoiron cast has often been identified as the lost model. Given the persistent misunderstanding on the part of those involved of the difference between the Copyright and Patent Offices, two wholly separate agencies with the latter, not the former, then a part of the Treasury department, coupled with the total absence of any firm evidence to confirm the claim, the best conclusion is that no model was ever placed on deposit. Conviction on the part of present-day copyright authorities supports this judgment, and further concludes that whatever the ambiguous entries signify, they most likely to not refer to deposited models but to additional copies of the “Photograph on file”. Lastly, even if one or more models had been deposited, it seems unlikely that Bartholdi would have used for the purpose a cast by Avoiron rather than one produced in his own studio which better represented the definitive design. 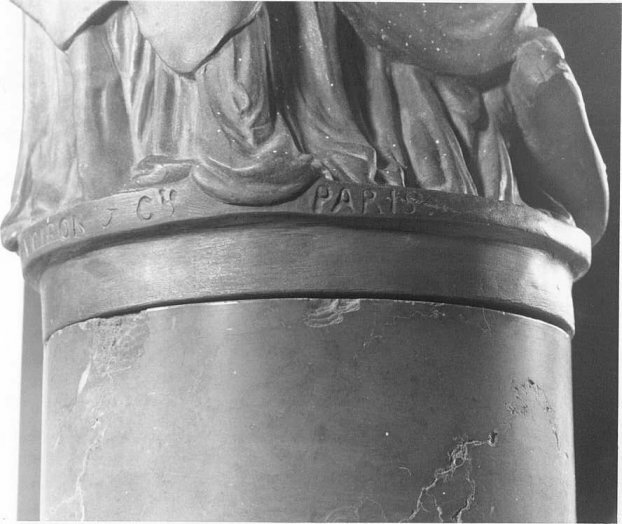 In correspondence, Bartholdi went to great lengths to emphasize Avoiron’s contractual rights to the reproduction of casts “in metals to imitate real bronze”, reserving to himself the right to produce statues of Liberty in terra cotta and bronze. With the sale of Avoiron’s rights in 1886, Avoiron is not again mentioned in Bartholdi’s correspondence and the year serves as terminal date for reproductions of the statue by Avoiron et Cie. Cast in zinc and electroplated in copper, with inscriptions including code letters and foundry name cast in the mold, Avoiron’s models present a variety of numerals all of which were cold-stamped after each cast was removed from the mold. Individual numbers that follow a cope letter may be assumed to represent the particular model’s place in sequence of casting, with the further assumption that Avoiron began production with Bartholdi’s four-foot modéle d’ ètude which he inscribed with a code letter “A”. At the same time, Avoiron reproduced models in reduced versions marked “B” and “C”, reductions made by mechanical means since they conform in scale of reduction to the technical limitations of the Collas machine; and all three sizes were doubtless in production more or less during the same period. On a fourth and smallest size, without a code letter, is found the cold-stamped numeral “8”. The numeral also appears on the cast “B 4” and in each instance placed in the same position on the rim of the small base. The numeral’s significance is impossible to determine, as are other cold-stamped numerals that appear on the upper surface of the outer corner of the tablet. Apparently limited to certain casts in the “A” size, numbers when they appear are in each instance different, and are presumably code numbers that served the foundry for some internal purpose. Cold-stamped numbers also frequently appear behind the diadem; in the “A” size from 1 to 7, and from 8 to 15 in the “B” size. An explanation lies in the foundry’s operation which to a degree was undoubtedly characterized by an assembly-line production, and the cold-stamped numbers served to identify for the workers the correct placement for each ray, similarly numbered and each separately made of sheet metal as well as slightly varying in size. Zinc, the metal employed by Avoiron, was an unpopular material for sculpture until development in the middle of the nineteenth century of techniques for disguising its surface appearance. In contrast to bronze, zinc was viewed as aesthetically unpleasing in color, and among the innumerable technical achievements of the century was the capability to alter the surface appearance of metals through the process of electroplating with other metals. In the instance of Avoiron’s casts, the use of copper caused by surfaces to resemble the more favored but altogether more costly bronze. Liberty cast in bronze was reserved by Bartholdi “to himself” and for the purpose he turned to the firm Thiébaut Frères. Avoiron was a commercial founder whose firm can be identified with none of Bartholdi’s numerous projects apart from Liberty, and is a name unknown among foundries of the period generally associated with cast reproduction of sculpture. Nonetheless, he was clearly an entrepreneur, and speculation suggests it was Avoiron who first approached Bartholdi rather than the reverse, as a firm only a short time under Avoiron’s personal management eager to exploit any opportunity. While the foundry cast Liberty in the “C” as well as in the sixteen-inch size with a flame as part of the cast, both of the larger sizes were usually not with cast flame but with fittings for either gas or electrical illumination and were accompanied by an acid-etched glass globe. In designing the cast with this added feature, Avoiron drew upon the firm’s corollary production of fixtures for electrical lighting. 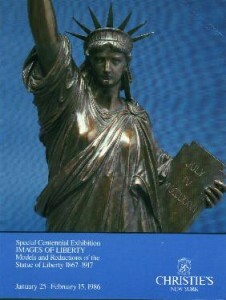 The result was a figure outside the conventions of sculpture, one that in embracing the latest technology-electrical illumination was in its infancy-was consistent with the structural innovations of the colossal statue itself and at the same time, an entirely apt, if literal, symbol of Liberty in the act of “enlightening the world”. If you are interested in owning an original Avoiron, call Christie’s or Sotheby’s auction house. If you are interested in owning an original Avoiron, call Christie’s or Sotheby’s.